With electrification of the tram networks around London at the end of the 19th century, causing disruption to the geomagnetic measurements at Kew Observatory, a new location was sought, as far away as possible from any towns, railways or industrial areas. This talk aims to highlight how 11 acres of windswept moorland became one of the UK’s foremost geophysical Observatories, detail some of the notable scientists who have worked there, the world-class monitoring and research carried out there and how the observatory, in some ways, changed the lives of the peoples of the Esk Valley. Peter joined the Met Office as an Observer in October 1988, working predominantly on RAF airfields. Over the years he has toured some exotic locations around the world, including the Falkland Islands (and Swindon!). In 2005, he was asked to undertake a detachment to Eskdalemuir Observatory, initially for 2 weeks, but he ended up staying for 12 months. Peter says he was delighted to be accepted for the role of Met Office Manager there in 2015. Raised at Eskdalemuir, where his father worked at the Observatory before taking over the operation of a British seismology facility in Brazil, Chris returned to work there sixteen years later after completing his Physics degree at St. Andrews University. 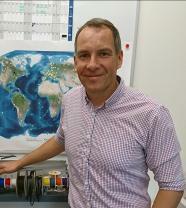 He is the current manager of the British Geological Survey’s global magnetic observatory network, and current chair of the observatories committee for the international INTERMAGNET network.